In his World Day of Peace message 2015, Pope Francis asks us to consider all men and women “no longer slaves, but brothers and sisters”. 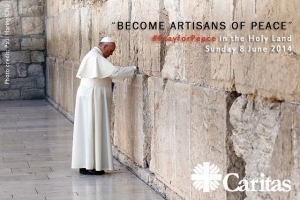 Caritas organisations around the world live and breathe the words of Pope Francis’ message by fighting modern day slavery, accompanying the poor and vulnerable on their journey and laying the foundations for respect, justice and love….and ultimately, for peace. Many Caritas organisations work to help the victims of trafficking on a material, legal, psychological and spiritual level. Caritas Lebanon’s Migrant Centre gives a home to women who are victims of human trafficking and exploitation. They are offered protection, legal and psychological help and escape from their slave-like conditions. Caritas Internationalis coordinates the work of the Christian Organisations Against Trafficking in Human Beings (COATNET) which raises awareness and fights for better laws to protect trafficked people and prevent exploitation. Caritas appealed for €60 million euro in 2014 to help those reeling from wars, epidemics and natural disasters. Caritas staff worked tirelessly on conflicts in the Middle East and South Sudan, on the Ebola crisis in West Africa and on natural disasters such as floods in Burundi and Serbia and a cyclone in Tonga. Caritas celebrated the role of women in feeding the world in 2014 with an International Prize: Women Sowers of Development. This was part of the confederation’s global food campaign ‘One Human Family, Food for All‘ which was launched by Pope Francis. “I spent my time praying to God and crying because water was coming in the boat.” Aashif undertook a long journey of hope from Bangladesh to Europe and Caritas welcomed him on his arrival. Caritas supports the Global Campaign to End Immigration Detention of Children. On the occasion of the 25th anniversary of the Convention on the rights of the child, it organised a Vatican Radio web debate to highlight, among other things, the issue of child migrant detention. Twelve-year-old Iraqi Christian Youssef doesn’t want presents for Christmas. “I don’t need anything. I just want to go home,” he said. “I just want to go to school again.” Caritas has been providing food, clothing, heaters, blankets and winterizing some of homes for around 10,000 Christians, Yazidis and Muslims in Iraq including Youssef’s family. Caritas members work for economic and social justice by monitoring both governments and companies. For example, Caritas member organisations in Great Britain campaign against the effects of on people and society of mining in Colombia.